There are many beautiful pieces of The Legend of Zelda fan art floating around on the Internet, but self-taught Hungarian artist, Adam Scythe, has created a watercolour painting timelapse that truly is a masterpiece. The previously featured artist posted his 2:57 long video onto his YouTube channel, and it really does showcase his artistic ability. 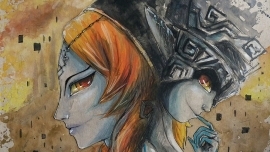 The painting depicts Midna, the princess of the Twilight Realm in The Legend of Zelda: Twilight Princess, both her true form and her imp form. Scythe really has captured Midna’s spirit here – giving her her famous mischievous smile, and mysterious eyes. The Legend of Zelda fan art I have ever seen. Facebook, YouTube, DeviantArt, and Etsy pages. What do you think about this stunning work of art? Let us know in the comments down below.